You'll be £16.99 closer to your next £10.00 credit when you purchase Salford Pals. What's this? 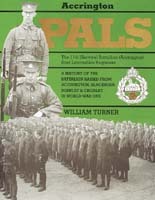 Salford was late in recruiting for its Pals battalions, with many of its men already joining Territorial units and a new Pals battalion in Manchester. Yet within a year it had raised four Pals battalions and a reserve battalion. Raised mainly from Lancashire's most notorious slums, the men trained together in Wales, North East England and on Salisbury Plain, they had great expectations of success. On the 1st of July 1916 the Somme offensive was launched and in the very epicentre of that cauldron the first three of Salford's battalions were thrown at the massive defences of Thiepval - the men were decimated, Salford was shattered. Michael Stedman records the impact of the war from the start on Salford and follows the difficulties and triumphs. Whether the actions small or great the author writes graphically about them all. Unusual photographs and a variety of sources make this both a readable and a scholarly account. Michael Stedman records the impact of the war from the start on Salford and follows the difficulties and triumphs. Whether the actions small or great the author writes graphically about them all. Unusual photographs and a variety of sources make this both a readable and a scholarly account. 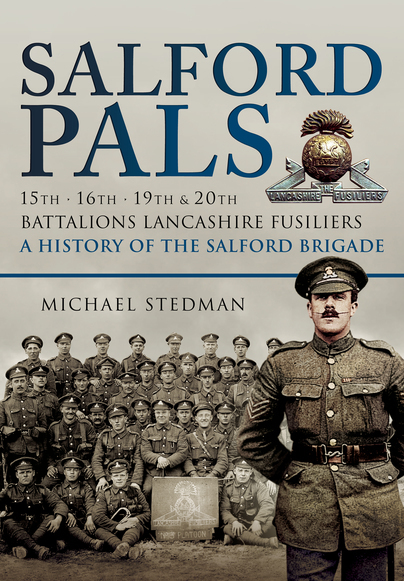 Michael Stedman has researched one of the most interesting books on the Pals battalions, that of the Salford Pals, who were part of the Lancashire Fusiliers. Today when you mention Salford, people automatically think of it as a borough of Manchester, but Salford has been a city a lot longer than its neighbour. Salford has always been a tough City of working men and women that have inspired writers across the generations. The Manchester Ship Canal ran from the Mersey to Salford Docks, where it would supply Manchester and the whole of East Lancashire with textiles, engineering materials, coal and many others products required by industry. This was part of the recruiting ground for the Salford Pals Battalions, from the docks to every street, and town hall within the borough. With pictures of the old Salford, one is given an idea of what Salford was like in 1914, there were no romantic visions of a city, just people proud of their city and their country. The book guides you through the training and how the battalions were built up; it was a training that meant that all men became brothers. The book also examines the service of the Battalion’s efforts at the Somme with pictures, maps, extracts of diaries and also poems, which the men were excellent at writing. There are some quite stark pictures as well as references in the book that help to make this book an excellent example of military history writing. After the war the ‘Old Comrades Association’ used to march down Chapel Street, the main road in Salford to attend the Thiepval Day Service at the Sacred Trinity Church. Situated there is a memorial to those who fell that day, and the service that continued for many years. But as the housing around the church was cleared and those old comrades died the service is no longer conducted. By strange coincidence, Sacred Trinity Church was also the church that the nurse Edith Cavell used when she tended to the poor of Manchester.